[New for 2016] I know it's not the same thing, but Edy's (Dreyer's) adding a bunch of candy flavored ice creams has me reminiscing about their excellent LoadeD line up from long ago. That stuff visited my freezer on so many occasions. Can the new half dozen candy flavors bring back the magic? I'm skeptical since the new Rolo flavor didn't wow me, but let's see how a chocolate based flavor can stack up. 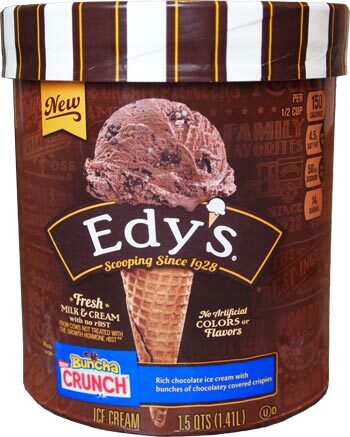 If you like Edy's regular chocolate ice cream, then you've already got one foot in the door here. I've already finished my first serving and overall, yes, this flavor combo works. I've been known to put rice crispies on my ice cream from time to time and this flavor is very much in the spirit of that. That said, it's not perfect. 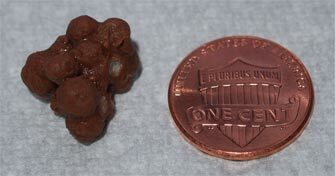 The buncha crunch like bits just aren't consistently crunchy and sometimes comes off as chewy. This may vary from quart to quart, but for me it's varying from spoon to spoon. Again, when it works, it's decent, and when it's a little chewy, well, you quickly move on to the next bite. So the flavor combo works and when you get a nice size bunch with your ice cream, you're left with a really nice chocolate on chocolate flavor that lingers on the taste buds. I'm definitely curious to see how the candy holds up as we dig down further. 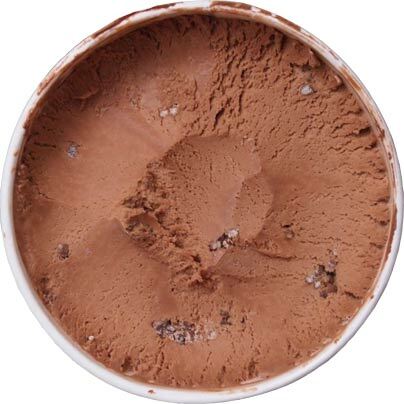 On Second Scoop: The postive: the flavor is pretty good as it almost has a malty note to it. The middle: the (updated?) Edy's texture isn't too noticeable against this particular flavor profile. The negative: the (faux?) buncha crunch just isn't holding up. When it's chewy it takes too much fun out of this one. 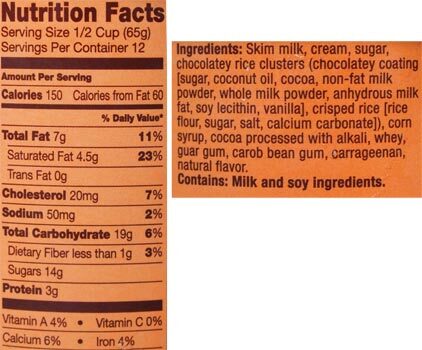 You are better off buying a tub of your favorite chocolate ice cream and a bag of buncha crunch and just mixing the two to whatever ratio you want. Assuming they were the same pieces as in the Mint Crunch, mine consistently had an odd texture. It's been several Halloweens since I remember eating a Crunch bar, but while I wasn't expecting the rice crispies to be super crisp or to really "crunch" in an ice cream, these just felt weird across my teeth (and the flavor wasn't as good as I remember Crunch bars being). Whereas the Crunch bar seemed to have at least some solid chocolate (i.e. the top layer didn't have visible rice crispies), these almost seemed to just be rice crispies enveloped in a thin layer of chocolate; maybe the ice cream was just using Buncha Crunch instead of pieces of normal Crunch bars. Even if my memory is imagining a tastier Crunch bar that didn't exist, the pieces (which were relatively plentiful, as you'd expect from a Grand flavor) felt unpleasant and tasted just OK to me, a disappointment for the primary selling piece of the flavors. I havent bought the mint version yet, but looking at my pictures from the store, yeah, they seem to have cheated and used the same mix-in. Boo for cheating on the name! I will also say that crunch bars arent nearly as awesome as they were when I was a kid. Crunch was one of my favorite candy bars back than but quality has definitely declined over the years. 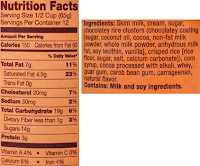 Edy's has given up on frozen dairy dessert, but they still use a good amount of food science for their regular and light ice creams. I personally prefer Krackle to Crunch. But I guess that is picky...kind of like picking Pepsi over Coke. I'd love to see a Hershey miniature ice cream with vanilla with little pieces of all the different miniature bars inside. That's a candy explosion for you.